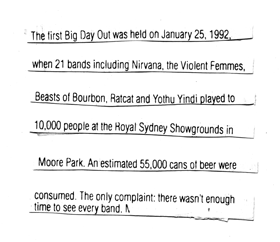 The Big Day Out began in 1992 Sydney Australia. The Big Day Out today begins its tour in Auckland New Zealand then travels to five destinations in Australia Gold Coast, Sydney, Melbourne, Adelaide and Perth. It is a music festival which includes international and local artists in a cross section of musical genres. It tours over a 2 week period beginning at the end of January, the Australian summer. For young and old the BDO brings together hundreds of thousands of people every year. Over the 6 shows more than 250,000 people celebrate their love of music. It could be said that the BDO has become a 'right of passage' in the Australian culture. ‘‘ the Big Day Out does has mythic proportions. Anthony Kleidis - The Red Hot Chilli Peppers, Melody Maker, February 22nd 2000.
to the ultimate rock'n book for all ages! Peace Love and Brown Rice A Photographic History of the Big Day Out by tour photographer, Sophie Howarth. This is the very first and only book to be released on the Big Day Out. It is a vibrant and beautiful ride through Australia's favourite music festival from when it began in 1992. The book is jam packed with not only snaps but stories, anecdotes and collected memorabilia from all the shows, presented in Sophie's distinctive scrapbook style, which makes you feel like you're there all over again. You can look at this book again and again and find something new everytime. Peace Love & Brown Rice showcases the colossal nature of the event, the enormous names it attracts aswell as the backstage candid moments, the hard work that goes into making it happen and most importantly the fans, those millions of people who it is all pulled together for. And all for the love of music. 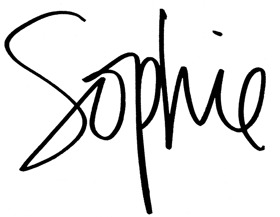 'Sophie manages to capture moments in a way that you can still feel the fun, dirt and sweat that goes with it, so much so that you are transported back and all you can do is smile and enjoy over and over again. A big, chunky book that is fitting for the subject - imagine what was left out! Working as a photographer in the music industry took off when I was at art school in 1991. The best way to put it is that 'it just took me'. I began photographing musicians playing live and promotional band shoots, in the recording studio and on the road. The photographs began to appear in magazines and papers, cd's and poster's for band promotion. It coincided with the beginning of the Big Day Out music festival in Sydney. The BDO then became an annual event that as a freelance photographer I followed around each summer. In 2003 I became an official photographer to the event. 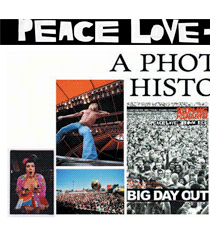 The production of 'Peace Love and Brown Rice A Photographic History of the Big Day Out' in 2005 was the next natural step in my career in music photography. 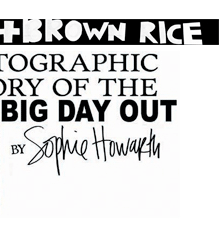 Designing and self-publishing with Jeremy Gordon 'Peace Love and Brown Rice A Photographic History of the Big Day Out' was a rewarding and life changing experience. In creating the book it allowed me to look at all these photographs I had collected and share my experience of what and how I saw something that I have been so close to for so long. The book was named with this in mind, this is my eye on the Big Day Out.